Eaton native Evan Terry was honored as a “hometown hero” during the Reds game versus the Los Angeles Dodgers on Sept. 12. BLUE ASH — Evan Terry is a military veteran who served two tours of duty in Afghanistan as a combat medic for the U.S. Army. He is also a student in the nursing program at the University of Cincinnati Blue Ash College, working toward a career dedicated to helping others. While Terry would deny it, the Eaton, native has earned the right to be called a hero and the Cincinnati Reds recently made it official. Terry was honored for his service and sacrifices as a “Hometown Hero” during the Reds game versus the Los Angeles Dodgers on Sept. 12. During the ‘Hometown Hero’ celebration, the honoree walked on the roof of the Reds dugout while the announcer read a brief biography highlighting his service. Josh Monson, the student veteran affairs coordinator at UC Blue Ash, nominated Terry for the honor. He says it was a nice surprise when he found out he had been selected. Terry credits Monson with giving him a lot of help in making a smooth transition to college after retiring from the Army in 2016. As for the next steps in his professional career, Terry plans to graduate from UC Blue Ash this spring and begin working as a registered nurse, while continuing to pursue his Bachelor’s in the Science of Nursing (BSN) degree through UC’s College of Nursing. 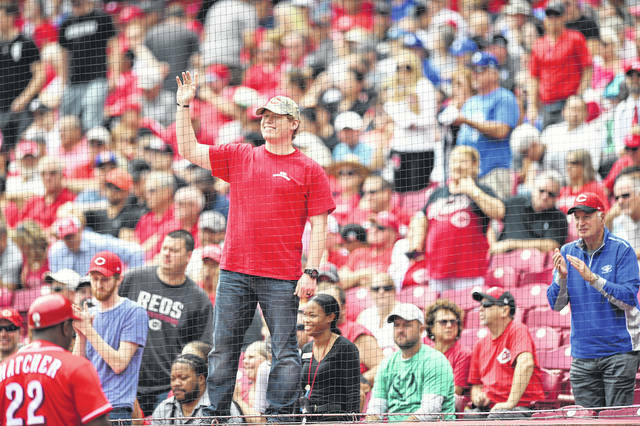 https://www.registerherald.com/wp-content/uploads/sites/41/2018/09/web1_Evan-Terry-Hometown-Hero-3.jpgEaton native Evan Terry was honored as a “hometown hero” during the Reds game versus the Los Angeles Dodgers on Sept. 12.